Give ordinary chicken fingers a spooky makeover with our tasty Monster Fingers Recipe. 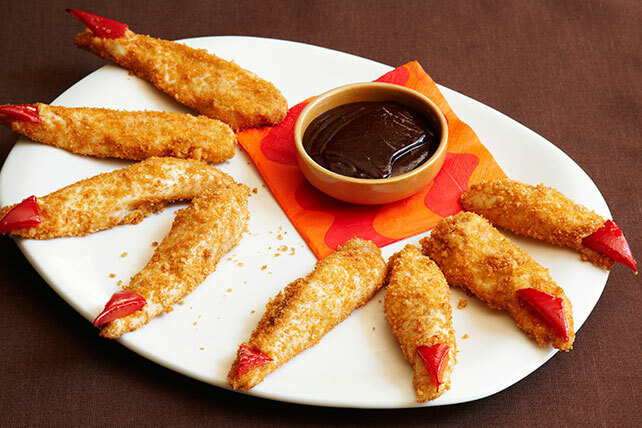 Crispy chicken is topped with red pepper and served with a BBQ sauce dip in this fun, scrumptious Monster Fingers Recipe. Coat chicken with coating mix as directed on package. Place on baking sheet sprayed with cooking spray. Bake 13 to 15 min. or until chicken is done. Make 1/2-inch slit in thinner end of each chicken strip; insert red pepper triangle in slit for the monster's claw. Serve with barbecue sauce. Arrange 4 claws on large serving plate to resemble each of the monster's 2 hands. Prepare using BULL'S-EYE Barbecue Sauce.